This pretty lady has rakish lines and a swept-back profile with an interior right out of a European design book. Her cockpit is shaded by the flybridge overhang and comes with a built-in transom seat, molded-in flybridge steps and a transom door. She is built on a fully cored hull with a wide beam, prop pockets (to reduce draft) and underwater exhausts. Both engines have recently been replaced with out of the box NEW. Master stateroom is forward with a centerline queen, generous drawer and locker storage, four opening ports and opening hatch overhead. 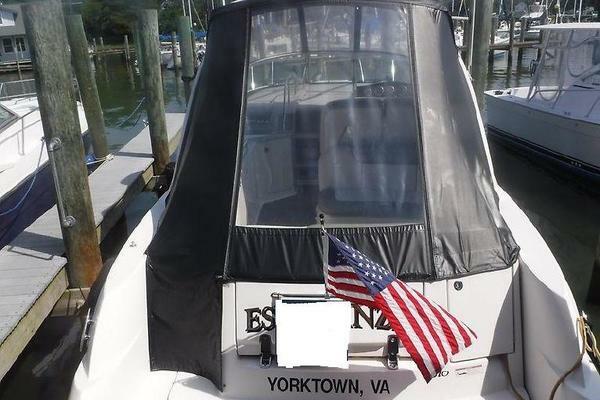 Head is to starboard with vanity, sink, VacuFlush toilet and stall shower. Guest head to port with vanity, sink, VacuFlush toilet and stall shower. Guest stateroom is aft to port with twin berths and good storage. Galley is down to starboard. Up two steps to the salon the dinette is to port and settee aft to starboard and another aft to port which converts electronically to a double berth. Cherry Vitracore and Ultraleather throughout. Gorgeous and absolutely spotless.